For sheer storage convenience and effective vacuuming duties, the cordless Gtech Mk2 K9 is an excellent alternative to a stick or cylinder vac. It’s arguably the most effortless model of all to use and is a great option for quick splurges around the home and for those who don’t want to feel like they’ve just run a marathon. Worcester-based Gtech specialises in the manufacturer of an eclectic variety of battery-powered products, from lawn mowers, grass strimmers and e-bikes to a growing range of cordless stick and upright vacuum cleaners and carpet sweepers. We’ve already featured the company’s popular standard AirRam upright vac in our Best Cordless Vacuum Cleaner guide so it was only a matter of time before we felt the urge to test this uprated, pet-specific version. And here it is in all its blackish shiny glory. According to Gtech, it has ‘improved the robustness of the K9 by using aluminium in crucial areas, helping it withstand the extra strain that pets can place on cleaning schedules.’ So, is more aluminium and less plastic worth the £50 extra? The very best thing about this cordless upright vac is its size and weight, plus the ability to stand up on its own, which in turn makes it a doddle to store anywhere in the home – under the stairs, in a cupboard, in a corner, etc. Unlike the average cordless stick model where the heavy motor and dust cylinder are in the handle area putting undue pressure on the wrist and forearm, this one has it all installed at floor level making the AirRam arguably the most effortless vacuum on the market. It’s perhaps for this reason that many householders have bought one as a second vac for quick shifties round the lounge after the kids have paid a visit. After all, it is just basically a powered version of the classic vintage manual carpet sweeper your gran used back in the 1950s and ’60s. The K9 weighs in at a reasonable 3.2kgs and its motor and cylinder housing measures a petite 30cm x 25cm x 10cm. To use, simply grab the handle, reach down for the extension button and put your foot on the power switch while pulling back on the handle to release it. And that’s all there is to it. There are no extra turbo or suction reduction buttons and you can’t adjust the height of the brush bar. But thankfully everything is set up so well that there really is no need to make any adjustments anyway. You don’t get any hand tools with this model so you won’t be able to tackle shelves, the car or any hard to reach areas. However, you could feasible do a flight of stairs with it. Before we look at its effectiveness, we should add that the K9’s dust collector is really small and that means you will need to empty it frequently – possibly as much as every two minutes if used on a dog-haired carpet. This writer and partner live with two Labradors and three cats – yes, I know, it’s a little excessive – and we mostly have hard floors with rugs. It only takes a day or two for any one of the rugs to be furred up even though you can’t see much evidence of it. One of the rugs measures a modest 3m x 80cm and the K9’s transparent dust cylinder needed emptying twice – for just one rug! Good job the bin was only metres away. What’s especially staggering about this vac is that, even though there is little evidence of hair or dust on the rug, the entire cylinder is very quickly jam-packed with hair that seemingly comes out of nowhere. It’s a proper WTF moment every time I use it and proof positive that this little titan is a top-notch picker-upper of animal detritus. Presumably its effectiveness has something to do with Gtech’s proprietary AirLOC system which allegedly picks up larger debris on the forward stroke and deeply embedded dust and pet hair on the backstroke. 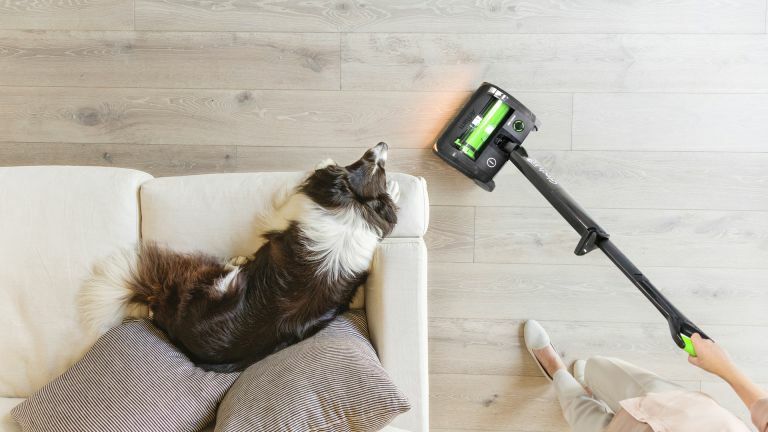 The K9 works well on hard floors, too, though it does struggle to collect some larger objects like wood chips, preferring instead to spit them ahead of the speedily revolving brush while you go around chasing them. To get round this issue, simply lift the whole unit up a centimetre or two and it’ll swallow the offending items in a thrice. Like most vacuum cleaners, this thing point blank refuses to work properly on any type of thin rug. However, where some vacuum cleaners (mostly the electric variety) may continue to swallow a rug, causing a great deal of fuss in the process, this one’s motor stops immediately and a red light comes on and stays on for at least ten seconds. You may need to untangle the brush bar if it has swallowed any tassels but usually it’s just a case of waiting till the red light turns off and continuing with the vacuuming. The AirRam K9’s low 10cm profile and articulated push handle means it’ll reach under the bed and other low profile furnishings with consummate ease. The handle can also be set at two different height positions. Although the lowest position is essentially for storage, it also happens to be just the right height for someone of short stature. Gtech has fitted an ingeniously easy and muck-free method of emptying the crap the K9 collects. You simply pull out the cylinder, flip open the side door and, while over the bin, slide a lever from one end to the other. Astonishingly, all the stuff it has collected is pushed out in a single compressed matt of hair, dust and other household impurities. Every so often you will be required to clean the filter system but this is simply a case of opening the opposite end of the dust cylinder, pulling out the flexible green foam filter and whacking it against a piece of garden furniture while avoiding the inevitable cloud of dust. Alternatively, follow Gtech’s instructions and give it a thorough wash and dry. The filter system also includes a scent cartridge – it comes with a spare – which definitely helps hide that awful ‘just vacuumed’ smell that any owner of a menagerie-filled abode will be familiar with. You might think an LED headlight strip is an unnecessary addition on a vacuum cleaner but you’d be wrong because there will be countless times when you think there’s plenty of natural light on the carpet when, in fact, there isn’t. This writer is gobsmacked every time by how well the K9’s headlight illuminates the path ahead. Only this morning I managed to avoid sucking up a tiny earring stud which I might not otherwise have seen. The AirRam is powered by a removable 22v Lithium-ion battery that just keeps on giving. Statistics suggest a runtime of 40 minutes on a single four-hour charge. Granted, it probably won’t quite manage two sweeps of a large house but given how compact this vacuum cleaner is, 40 minutes is pretty much par for the course. Thankfully, it also comes with a four-stage LED display that keeps the user informed of its charge status. Who is the Gtech AirRam Mk2 K9 best for? This vac is most suitable for pet owners in two-bedroom dwellings though it could, at a pinch, handle larger abodes. If you live in a small flat or house and don’t mind using a dust-pan and brush or cordless hand vac for those hard to reach areas, then this is arguably the only vacuum cleaner you’ll need. But if you live in an average-sized house with three bedrooms or more, perhaps consider buying one as a compliment to your current vac. It really is an excellent option for those quick whizzes round the living room, kitchen and bedroom. To be honest, this user isn't sure this pet-specific vac is worth the extra £50 over the standard Mk2 model. Granted, the brush bar definitely feels more robust and stiffer and the uprated aluminium parts should help it last longer. But it didn't seem to perform any better than the standard model. What isn’t in doubt is that it vacuums stuff up admirably well, is effortless to push around and incredibly easy to store without the need for any fiddly wall mounting brackets. Put another way, if you happened to own a corded Miele, a cordless Dyson stick and one of these, I guarantee that this is the model you’d reach for most of the time. It really is that convenient.